Mira survives a car accident, and awakens without a memory of her past. As she is regaining pieces of her life with husband Paul and blind daughter Sophie, her business associate Dave convinced her to leave her husband as what she promised her before the accident. However, the situations go more weird as strange things start to occur in her home. Mira is forced to confront her past and discover the real story. 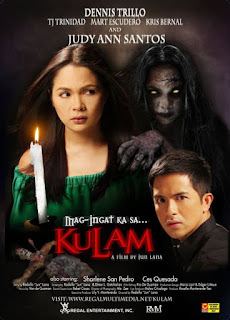 Mag-ingat Ka Sa... Kulam or Kulam is a Filipino horror film starring Judy Ann Santos and Dennis Trillo. It is produced and released by Regal Films as part of their year-long 48th anniversary celebration.